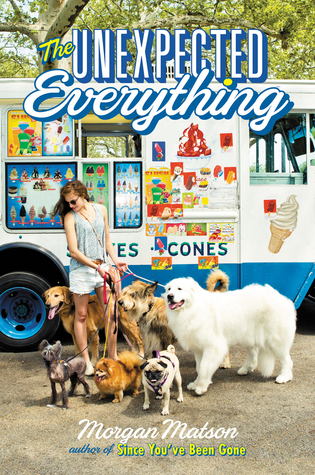 The Unexpected Everything is the latest release from Morgan Matson, who happens to be one of my favorite contemporary YA authors ever. It’s about Andie Walker, who has her summer all planned out… until a scandal erupts over her father’s political campaign. Andie’s carefully controlled plans are ruined, and she’s left with no clue how her summer will go. Slowly, her summer is filled with things she doesn’t expect – including new friendships, the growing pains of old friendships, a different sort of work experience and a very cute romance. Honestly, there is something truly magical about Morgan Matson’s ability to write a contemporary YA novel. I’ve loved every single novel I’ve ever read from her, and The Unexpected Everything is yet another addition to her work that I enjoyed. I know I’ve said it before, but it still holds true: Morgan really knows how to carefully construct complex characters. Because I always wind up falling in love with and relating to her main characters (and the secondary characters too), I also always end up devouring and loving Morgan’s stories. All in all, while I felt the novel was a touch long, The Unexpected Everything was lovely. In classic Matson style, it chronicles one teen girl’s experience as her life changes – and it was so well done. I really enjoyed the balance between the emotional bits with a ton of light-hearted moments, and I definitely would recommend this novel to any contemporary YA fans out there, especially for some fun summer reading! Andie had it all planned out. When you are a politician’s daughter who’s pretty much raised yourself, you learn everything can be planned or spun, or both. Especially your future. But that was before the scandal. Before having to be in the same house with her dad. Before walking an insane number of dogs. That was before Clark and those few months that might change her whole life. Because here’s the thing—if everything’s planned out, you can never find the unexpected. And where’s the fun in that?